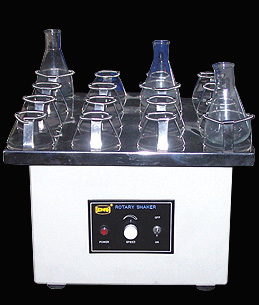 Prominent & Leading Manufacturer from Vadodara, we offer Rotary Flask Shaker(Variable Speed), Incubator Shaker, Shaking Incubator, Rotary Shaker Machine, Rotary Shaker and Conical Flask Shaker. Rotary Shaking Machine is useful for uniform mixing in a circular motion in a horizontal plane with a circuit diameter of about 25 mm. Extensively used in tissue culture work, aeration of fermentation and other chemical mixing procedures. Rotary shaker is used in microbiological, virology lab and bacteriological pathological pharmaceutical work. The driving mechanism is enclosed in a mild steel sheet cabinet beautifully painted. The shaker is fitted with DC Motor with electronic speed regulator. The DC Motor will ensure continuous work and precise speed control. The shaking speed will be 50-250 RPM approx. The shaker is designed with a new concept of single or a set of an Eccentric shaft which eliminates the tension soaring. Our organization is engaged in offering a vast range of BOD Incubator to our clients. The incubator offered by us is extensively admired for its flawless functioning and hassle-free performance. Moreover, it is precisely manufactured by our experts using high grade components and innovative technology in complete compliance with universally accepted norms of quality. Clients can avail this incubator from us at rock bottom prices within promised time frame. Compact counter balance drive mechanism. Highly efficient Brushless Induction Drive Motor. Electronic AC frequency Drive for smooth RPM Control. Castor wheel for easy moveability. Variable speed from 50 to 250 RPM. OperatableÂ 50 to 160/180 RPM Max. Interchangeable trays for various size (Optional). Digital Display & Control (Microprocessor PID Control Based). Full view Inner Glass Door. Force Air Circulation for uniform temperature. Slow Temperature Rise Heaters for long life. BOD Incubators Exterior boy is fabricated from Mild Steel material, which is powder coated in attractive shades. Interior chamber is also fabricated from Mirror polished Stainless Steel S.S. - 304 Material Outer double walled metal door with sponge - type silicon gasket for air-tight sealing as to avoid leakage of chamber uniformity Electrical wiring as per CE Compliance - with individual numbering of each internal circuitry wire for ease of maintenance & Repairing Chamber illumination is accomplished by Fluorescent light with door switch. Cord wire duly tested and inspected with stress factor as per CE standard Electric Motor of blower located at the back side of unit, which is protected with safety cover to avoid accident Standard motor of reputed companies - such as CG, GODREJ or GE Make User friendly and tactfully designed chamber door and locking mechanism Aesthetic outer appearance and high quality Unit mounted on castor wheels for easy movement. “NOVA ”MICROPROCESSOR BASED PID CONTROLBASED B. O. D. INCUBATOR WITH SHAKER Â is specifically designed to cater theÂ needs of IncubationÂ and routineÂ determinationÂ ofÂ BiologicalÂ OxygenÂ DemandÂ on WaterÂ andÂ Â Sewage,Â Biotechnology,Â Â TissueÂ Â Culture, Cultivation of Bacteria, Storage of Dairy Product, Shell Life Test,Â MedicalÂ Application,Â Microbiology,Â Virology,Â R & D, Pharmaceuticals, Bacteriological, Pathological & Q.C. Work.Nova Instruments For BOD Incubator in Ahmedabad, BOD Incubator in Baroda, BOD Incubator in Surat. Heating by long lasting air/strip heaters provides heating above ambient temperature with Electronic PID Control and display system. Hermetically sealed compressor/condensing unit coupled with evaporation coil and fan cooled condenser provide cooling below ambient temperature.